How can you add a 4-way switch to an existing 3-way switch network? I had a good question from a site visitor wanting to know how to add a 4-way switch to his existing 3-way switch network in the garage. I have a 3 way switch in garage, now I want to put a switch in the house to turn off the lights after I am in the house not while I am in the garage. How can I splice into that 3 way and put in a 4way switch inside the house? 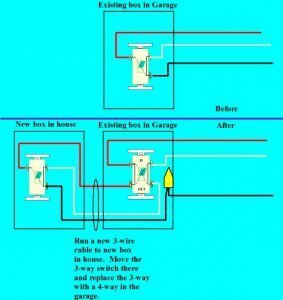 The easiest way to accomplish this is to change the thinking from adding a 4-way in the house, to moving the 3-way switch from where it is now, and changing the existing 3-way to a 4-way switch in the garage. 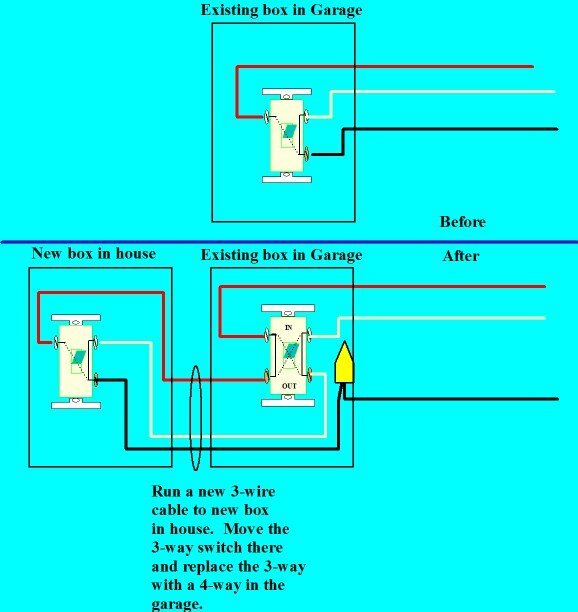 Run a new 3-wire cable to the desired box location in the house. Then move the existing 3-way switch to the new box, and install a new 4-way switch at the existing location in the garage. The following diagram shows how this could be done. I am showing a situation where the existing 3-way switch box contains only a 3-wire cable. Regardless of how the existing 3-way network is currently wired, the way to add the neccessary wiring remains the same. You might have to change the box in the garage to a larger one that can accomodate the additional 3 conductors that you will be adding to the box fill count / calculation. Take the wire that is now connected to the common terminal in the 3-way switch network, and splice it to the black wire in the new 3-wire cable going to the new switch box. Take the existing wires that are now connected to the other 2 traveller terminals, and connect them to the “in” or the “out” terminals of the new 4-way switch. Connect the returning travellers from the new switch box location (red and white), and connect them to the “in” or the “out” terminals on the new 4-way switch. Connect the black wire of the new 3-wire cable to the common screw of the 3-way switch that you will move to the new location. This is a great idea, adding a switch to control the garage lights to enable shutting them off from the house. I assume that in this situation you can see (through a window?) that the lights were left on. To alert you that the lights are on in a situation where you can’t see in to the garage, a 2-gang box with a 3-way switch in one side, and a pilot lamp in the other side could be wired to show when the lights are on, but this would require a 4-wire cable in the house as you would need a neutral conductor for the pilot light to function. This entry was posted in Electrical Wiring, Indoor Wiring and tagged 3-way switch, 3-wire cable, 4-way switch, add a 3-way switch, add a 4-way switch, add a switch, four way switch, three way switch. Bookmark the permalink.